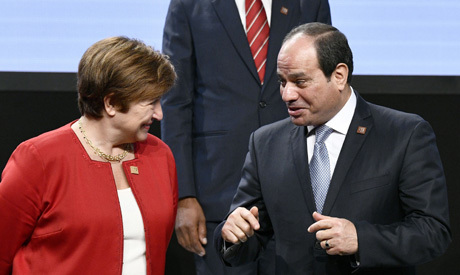 Egyptian President Abdel-Fattah El-Sisi met on Tuesday with Chief Executive Officer of the World Bank Kristalina Georgieva to promote cooperation, El-Sisi's spokesperson Bassam Rady said. The meeting came on the sidelines of the Egyptian president's four-day visit to Vienna. El-Sisi stressed Egypt's keenness to promote cooperation with the World Bank as a partner in the sustainable development process in Egypt, says Rady. Georgieva stressed the bank's efforts to develop the consultation and coordination frameworks with Egypt to continue supporting the country's economic reforms and social reform programme. She highlighted that the economic reforms implemented by the Egyptian government have achieved positive results reflected in raising growth rates, reducing the budget deficit and achieving macroeconomic stability. The World Bank official also said that the business and investment climate has drastically been improved. El-Sisi travelled to the Austrian city on Saturday to attend the EU-Africa summit which took place on Monday. In October, Egypt agreed to a new $3 billion financing deal with the World Bank, which the Egyptian investment ministry said would help secure economic growth. Some of the projects support Egypt's private sector, while others aim to support education reform in public schools.